Considered by many to be the ultimate, the highest art of massage. To simply and deeply find and support the calmness, the strength, the confidence, the beauty that lays in your tissues. 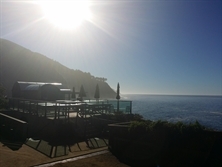 Esalen massage was developed over 50 years ago, on the coast of Big Sur, California. It was originally based on the fact that the body is a self-correcting and self-healing system. With long, slow strokes, an Esalen Massage eases your attention and your awareness into your body, out of your busy mind and "to do" lists. We work together (partners is their term) to help your body find and be in comfort and ease. Think of it as feeling great because, deep down, you are. Edward has serious ability to turn off my tensions and allow me to reset, so softly.